A marvellous Egyptian Slot is within your reach on Wicked Jackpots! Travel over Phoenix Sun Slot which is based on the outstanding ancient legends of the Phoenix. This video slot features a 5 reel and 243 to 7776 ways to win! You can enjoy 1716 times your stake on every free spin. It is amazing, is it not? Play this fabulous creation by Quick Spin on your smartphone, tablet and desktop devices since it is optimised on all your iOS and Android devices. 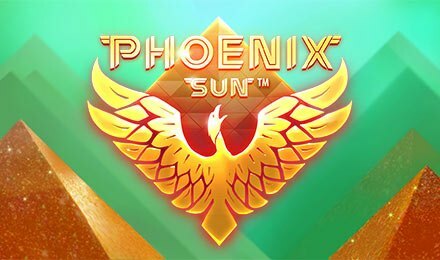 Board on Phoenix Sun Slot and discover the legendary Phoenix Bird! As you carry on with your spinning frenzy, you will find the reels squeezed with a wide range of symbols such as the playing cards A, K, Q, J and 10. To bring some Egyptian feel to the reels, you will find Tutankhamun, Bastet, Scarab, Cleopatra and Anubis. These symbols carry their own payout and as you spin the reels, they might create some sensational winning combinations. Set your betting options according to your likes and enjoy your spinning adventure. Bet Levels: On Phoenix Sun Slot you will find no Bet Levels. Amount of Paylines Selection: Looking for paylines? You will find none! However, it is a 243 to 7776 ways to win online slot. Coin Values: No coin values are available on this slot machine. However, the Total Bet ranges from 0.25 to 100.00. Travel virtually into the Egypt world and discover the amazing surprises that it unfolds. During your spinning episode on Phoenix Sun Slot, you will find the wild symbol that is depicted as the yellow rectangle with the word WILD labelled on it. The wild can take the place of all the symbols bar the Phoenix Wild. On the Phoenix Sun Slot you will find another wild called the Phoenix Wild and it can act as a substitute for all the symbols on the reels. It will not appear during the Free Spins Feature. If you are wondering how the Phoenix Rising Respins works here’s an overview. The feature can be triggered by the wild on a winning payline. Then, every Phoenix Wild symbol will eliminate three random tiles from the cover that is found above the 3x5 reel grid. This will launch a respin with the expanded reel layout. Now, what will happen is that the game will respin and stop only when there will be no more Phoenix Wild symbols coming into view in a winning combination or when the Free Spins are won. During the Free Spins Feature you can be bestowed with 8 Free Spins. Try to collect 5 Phoenix Wild symbols in a game round. You will play the free spins on a full reel grid of 5x6 with 7776 ways to win.